If you have any thoughts of having a solar electrical system in your house, it will always be better to have a look at the changes that you could make in your living habits and energy consumption, that could suit the new system. You can save a considerable amount of money by employing eco-friendly power systems. Along with saving money, you are doing something good for the nature also. First thing you should do before installing a solar electrical system in your house is, to make the necessary changes to cut down the dependency on grid power and fuels. Solar power is the future power source and before installing a solar electrical system, you should know how much power you require. Irrespective of whether your system is small or big, it will require certain equipments for its panel operation and to harvest power. Mounting has to be done in a proper manner and has to be done in a secure place, to protect it from winds and other hazards. It should be installed in such a way that it gets maximum exposure to solar rays and the location should be decided by taking all these factors into account. If multiple panels are used, there arises a need for a safe and secure way to connect all these panels and you can use the Collector Box for this purpose. The wiring should be of the required type and size, otherwise you may lose significant amount of power due to wire resistance. 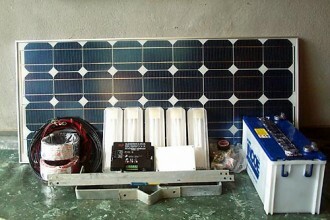 Wires from the panels run to the collector box and from there to the solar charge controller. Here we use combiner box, which is basically used to collect wiring from multiple solar panels and from the combiner box, a set of wires run to the solar charge controller. For protection from overheating and overload, a breaker switch (fuse) has to be employed on each solar array. Electrical controllers are used to control the electricity generated and then the electricity will be fed to the battery. The solar charge controller wiring should be in accordance with the panel size. Along with this an over current protection system has to be employed to protect personal hazards and to protect the major components of the system. Inverter converts the DC power generated into AC and the wattage of the inverter should be in accordance with the total watts of power required at one time. Without using deep cycle batteries, you can only use the power in real time, i.e. you can use the power only when the sun is out. Deep cycle batteries are very different from car batteries as they can survive the frequent charging and discharging cycles, typical of renewable energy systems. Battery storage capacity is expressed in amp hours and the number of batteries should match your energy requirements. More and more people are now turning to solar systems for their energy requirements and we recommend you to get a comprehensive home solar guide that will help you in each and every step of your solar installation. Installing a solar electrical system is not a tough job at all and all you should do is to have enough knowledge about an efficient and safe installation.